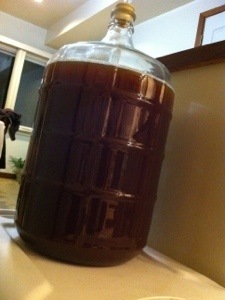 We brewed an all-grain batch of brown ale this time. 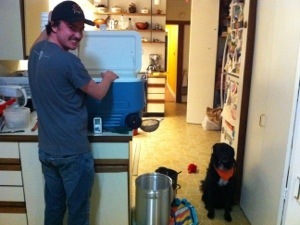 We used a lot of grains… too many for our pot… so we ended up rigging up this cooler system. It was pretty funny, but it worked. 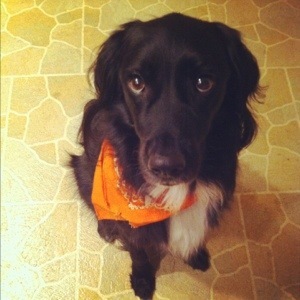 Throughout our brewing process, the dog seemed a little stressed out that we were rearranging the kitchen. He’s in the picture above looking distraught. Making an all-grain batch of beer leaves you with A LOT of spent grains. It seems like such a waste to throw them out so I started making Monk some doggie treats out of them. Maybe if he knows treats come after beer he will relax a little. A little FYI – Dog can not have hops!! It can really hurt them. You can read about it here. The spent grains come from the step in the beer making process BEFORE you add hops – so they are safe to use. If there are hops mixed in with your grains, do not use them for dog treats! 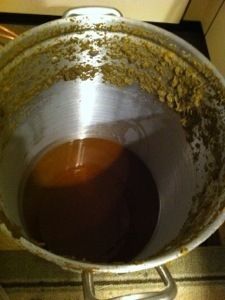 Here is our boiling pot after we added hops… don’t let your doggie get into that! Collect about 4 cups of the spent beer grains and drain them well. The more moisture they contain, the longer your biscuits will take to dry out. In a stand mixer combine 2 1/2 cups flour, 4 cups of spent grains, two large eggs, and about 1 cup of peanut butter. Mix until everything is combined. 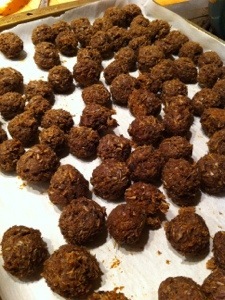 You can make the treats two ways: squares or roll them into small balls, just like mini meatballs! It is kind of difficult to make them into other shapes because the dough is super sticky, not really cookie cutter friendly. 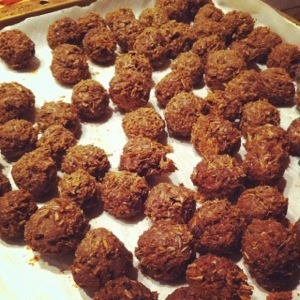 To make the mini meatballs, just roll the dough out into small balls and place them on the tray. It’s ok if they touch a little bit because they will break apart. Bake the treats for 1 hour at 350 degrees F for about an hour. Break up any treats that have stuck together and turn the oven down to 200 degrees F. Let the treats bake for a few hours, or until they are hard. Make sure they dry out throughly or else you won’t be able to keep them for long… they will get moldy! To make square biscuits, spread the mixture onto a sheet pan in a layer about 1/4 inch thick. Bake it at 350 degrees F for about an hour. Remove the pan from the oven and cut the sheet into smaller bite size squares. Separate the squares, turn down the oven to 200 degrees F and place them back in the oven for a few hours. Make sure they dry out, remember they won’t keep if they are still moist inside. If you use this method, make sure you cut the treats after an hour – If you bake it for too long and let the whole pan get hard it is really difficult to break apart. Another variation is to add some beef flavoring to the treats instead of peanut butter. I recommend using these new concentrated broth packets made by Knorr. There’s a lot of flavor packed into the little packet and it won’t make your treats too wet like adding regular stock would. I hope your doggie likes them… Monk does! He patiently waits for them to come out of the oven.